Happy New Year 2019 The BRAND NEW and Improved iOS App has Rolled Out! The Brand NEW Version of the Android App is HERE! “Welcome to Jazz Con Class Radio! This is an Online Jazz Station. Broadcasting Live, High Quality Classic/Traditional Jazz 24Hrs/7Days. Designed on specialized playlists which stream concurrently with a schedule(changes every week). The schedule is specifically structured with a “Global” audience in mind, so the listeners could enjoy the music respectively in their time zone and when they are awake. Created for the preservation of a “Truly Improvised” musical art form known as JAZZ! Directed specifically towards those, Young and Old, who respect and acknowledge authentic, creative musicianship. Jazz Con Class Radio gives “all” the listeners the advantage of an additional path/choice which envelops another opportunity to expand their range of musical knowledge. THANK YOU and ENJOY! Note: Working on the iOS App Store version, will be coming out within a few days or so. 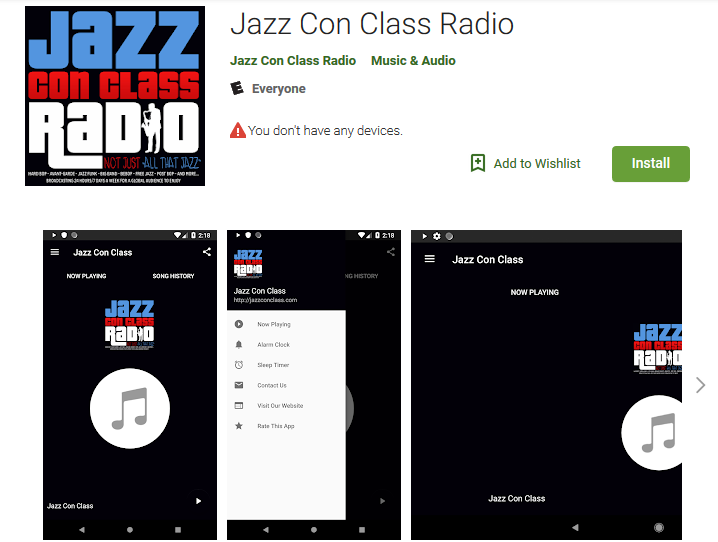 Keep updated on all Jazz Con Class App News for Android/Apple over here.